We are starting to see the emergence of organizations talking about their “environmental handprint”. Supposedly it’s the positive contribution to off-set their (presumed negative) footprint. Why do we need to invent a different construct for positivity? A footprint can be positive as well as negative! You don’t have to be destructive, you can be intentionally regenerative or positive, by design. It’s a design choice! That’s the fundamental premise of Cradle to Cradle® design. 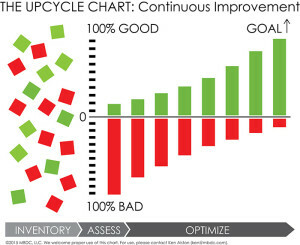 We already work with our clients using our “Upcycle Chart” to show the shift from just focusing on reducing the ‘Bad” to also increasing the “Good” or positive outcomes. Most company sustainability efforts have been (and still are) predominantly in the “red zone”. This is because the concept of Eco-efficiency has long been the predominant strategy of companies in the World Business Council for Sustainable Development. Perhaps not surprisingly, these Eco-efficient efforts to reduce, minimize or avoid “bad” or negative impacts often save money, so they are really cost savings programs which happen to focus on negative environmental impact areas. The main business driver is the cost saving. Our work implementing and integrating Cradle to Cradle® design principles in product development with companies is both Eco-efficient and Eco-effective. By creating positive goals, implementing strategies and tactics to support their achievement we simultaneously reduce the negative footprint and increase the positive footprint in a continuous quality improvement process. Becoming positive is where you go beyond achieving a “Zero goal” and you create benefit. You don’t need a hand to offset a foot! The environmental handprint is a redundant construct. A hand is different from a foot because it fulfills different functions. Your hand isn’t the opposite of your foot. So let’s celebrate moving beyond reductionism and assuming a footprint can only be negative. Show your positive footprint growing as your negative footprint shrinks! Just say “NO” to the environmental handprint! Cradle to Cradle® is a trademark of MBDC.